carbon, accompanied by resistance to degradation and low rates of decomposition of organic carbon in the oxygen-deficient water column. This high availability of carbon and the short diffusional gradients in shallow vegetated wetlands result in differences in biogeochem-ical cycling compared with ponds and lagoons. Wetlands are autotrophic ecosystems, and the additional fixed carbon and nitrogen from the atmosphere are processed simultaneously with the pollutants introduced from the wastewater source. The net effect of these complex processes is a general decrease in pollutant concentrations between the inlet and outlet of treatment wetlands. However, because of the internal autotrophic processes of the wetland, outflow pollutant concentrations are seldom zero, and in some cases for some parameters they can exceed inflow concentrations. 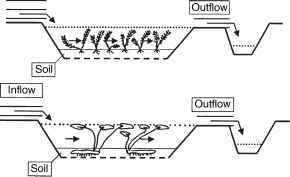 A typical FWS CW consists of a shallow basin constructed of soil or other medium to support the roots of vegetation (when rooting macrophytes are used) and a water control structure that maintains a shallow depth of water (Figure 2). Besides planted macrophytes natural assemblages of volunteer re-growth from native seed banks are also in use. Flow is directed into a cell along a line comprising the inlet, upstream embankment, and is intended to proceed all portions ofthe wetland to one or more outlet structures. The shallow water depth, low flow velocity, and presence of the plant stalks and litter regulate water flow and, especially in long, narrow channels, ensure plug-flow conditions. One of their primary design purposes is to contact wastewater with reactive biological surfaces. FWS CWs (sometimes also called SF CWs) function as land-intensive biological treatment systems. Inflow water containing particulate and dissolved pollutants slows and spreads through a large area of shallow water. Particulates, typically measured as total suspended solids (TSS), tend to settle and are trapped due to lowered flow velocities and sheltering from wind. Most of the solids are usually filtered and settled within the first few meters beyond the inlet. While settleable organics are rapidly removed in FWS CWs by quiescent conditions, attached and suspended microbial growth is responsible for removal of soluble biochemical oxygen demand (BOD). The major oxygen source for these reactions is re-aeration at the water surface. 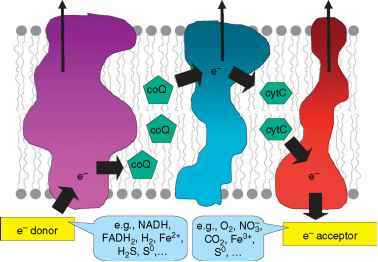 converted to free nitrogen or nitrous oxide in the anoxic zones by denitrifying bacteria. Volatilization is likely as both plankton and periphyton algae grow in FWS CWs and higher pH values during the day may be favorable for ammonia loss. FWS CWs provide sustainable removal of phosphorus, but at relatively slow rates. Phosphorus removal in FWS systems occurs from adsorption, absorption, complexation, and precipitation. However, precipitation with Al, Fe, and Ca ions is limited by little contact between water column and the soil. Substantial amounts of nitrogen and phosphorus may be stored in the peat/litter compartment. Algal and microbial uptake may be high but this retention is a short-term process and nutrients are washed out from the detritus back to the water. Macrophyte uptake as a removal mechanism in FWS CWs is restricted by the fact that vegetation is not regularly harvested. Also, the amount of N and P sequestered in aboveground biomass is usually quite low as compared to inflow loading (usually <10%). The only exception are CWs with free-floating macrophytes where harvesting is necessary for a proper function of the system.